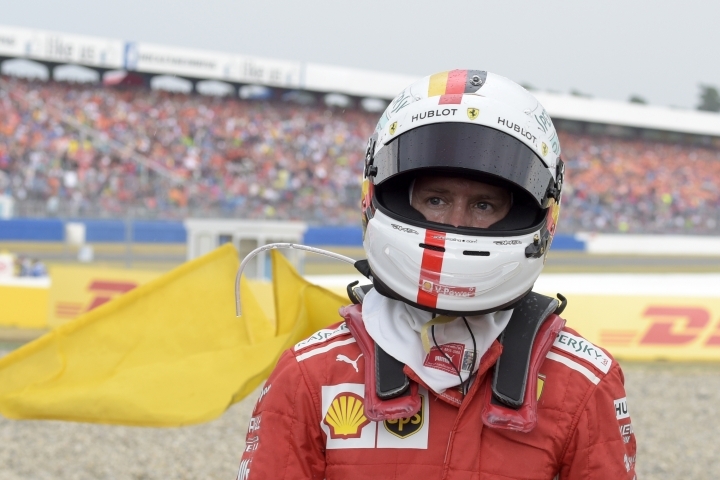 HOCKENHEIM, Germany — Even though Sebastian Vettel has won four Formula One titles and 51 races, he is still prone to worrying lapses of concentration. 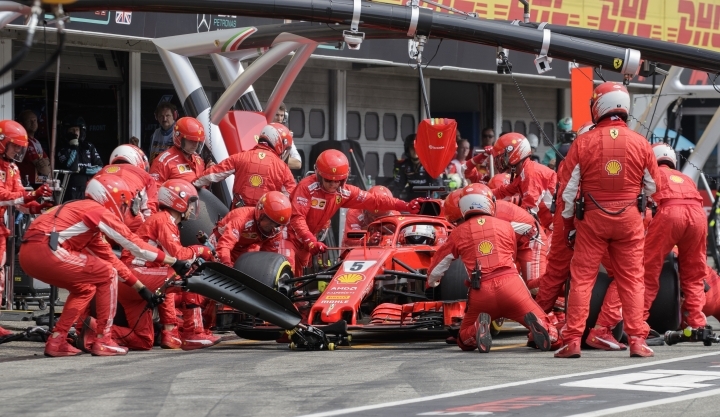 The Ferrari driver accepted his small mistake at Sunday's German Grand Prix cost his team in a big way, and gifted Lewis Hamilton and Mercedes a victory they could hardly have expected. Leading both the drivers' and constructors' championships before the race, Vettel and Ferrari are now behind in both. 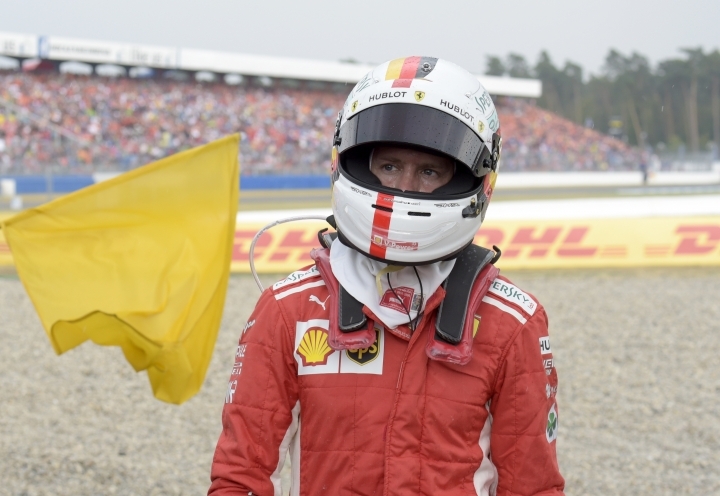 As the rain came thudding down at the Hockenheim ring — near to where Vettel grew up — his judgment seemed to slip away. 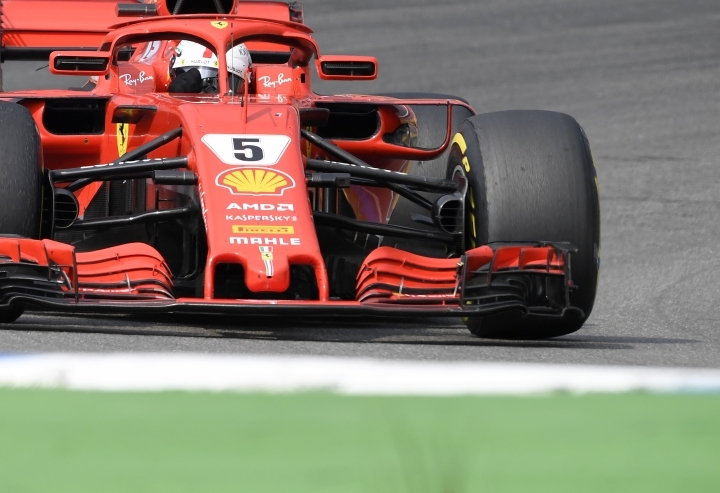 Leading from pole position with only 15 laps to go, Vettel misjudged a routine entry into a turn, slid off the track and slammed into the barriers. Even worse, Hamilton profited from his mistake to reclaim the championship lead by 17 points. "I threw it away. It was my mistake. We had the pace and we controlled the race for most of it," Vettel said. "We had the race in the bag." Vettel, who made key mistakes last season as Hamilton secured the title, seemed keen to use the rain as a factor for his crash on Sunday. "It's not like tonight I'll have difficulties to fall asleep, because of what I've done wrong. We didn't need the rain," he said. "It was a small mistake but a big impact on the race. A tiny bit too late on the brakes, I locked the rears and I couldn't turn. It wasn't the biggest mistake I've done, but one of the mostly costly ones." Vettel climbed out of the car and kicked the gravel in frustration. 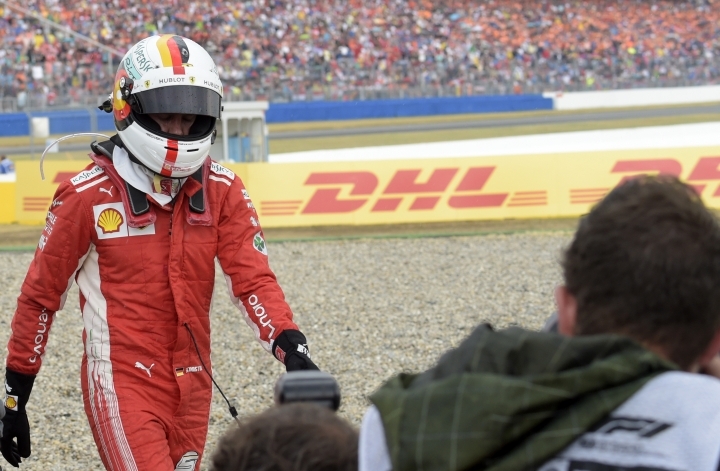 "I realized quickly that it was over," said Vettel, who again played down his mistake. "I think it feels better if it's spectacular, because then you've done something really wrong." He added that "I didn't do much wrong" but his performance was "not enough to finish the race." Vettel and Hamilton are both chasing a fifth F1 crown to move level with Argentine great Juan Manuel Fangio and go two behind record-holder Michael Schumacher. After the Azerbaijan GP in June 2017, Hamilton publicly spoke about his rival's apparent vulnerability under pressure as something he could exploit. Vettel had played a very weak hand in Baku. Irritated by what he perceived to be Hamilton's deliberately slow driving behind a safety car, he accelerated alongside the British driver and then inexplicably swerved into the left side of his Mercedes. Vettel subsequently apologized but by September the German driver had lost his way, never regaining the momentum after a huge mistake in Singapore. Before that Grand Prix, Vettel was only three points behind Hamilton with seven races remaining. He took pole position and, better still, Hamilton was fifth on the grid. It was the perfect scenario but Vettel went diagonally across the track to cut off Red Bull driver Max Verstappen and crashed out of the Singapore GP. With 25 points beckoning, Vettel got none. The nightmare scenario concluded with Hamilton profiting from the chaos to win. It was a similar scenario at Hockenheim on Sunday.